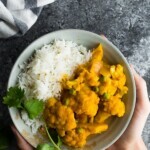 Instant Pot cauliflower korma is vegetarian comfort food! 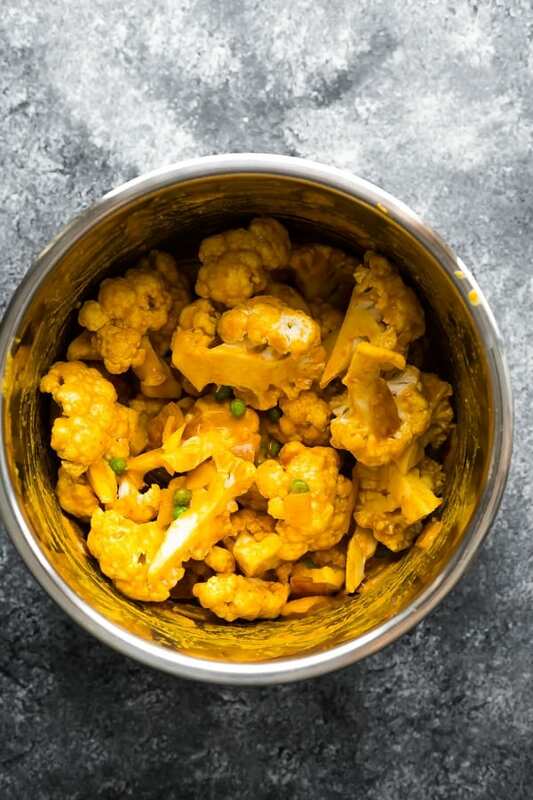 With a creamy sauce, cauliflower and peas, this recipe is cooked in your Instant Pot. You know how much I love my Instant Pot? I do, I do, I do! 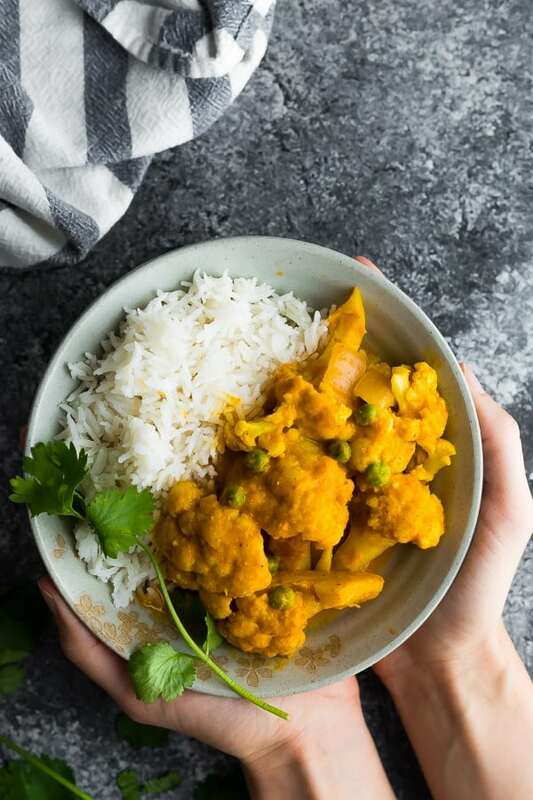 While I’ve posted my share of Instant Pot chicken recipes, I haven’t posted nearly enough vegetarian options…so today’s Instant Pot Cauliflower Korma helps fill that void. from Manali Singh. 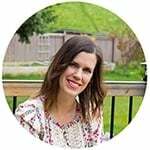 Be sure to check out her blog Cook with Manali! you can cook it in your Instant Pot! I loved trying this recipe because it’s totally outside of my area of expertise, yet still simple enough to prepare. 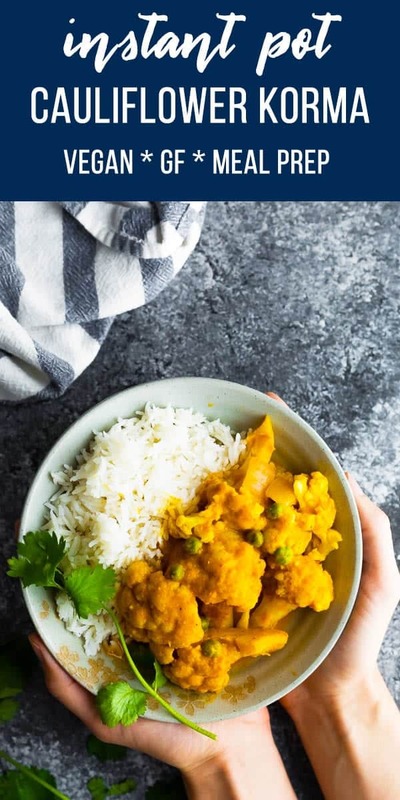 The only tricky thing with this korma recipe is the number of ingredients, so I recommend you have everything chopped and measured before you start cooking. get your yogurt measured and sitting out so it’s at room temp when you need it. prepare a puree of tomatoes, ginger, garlic, a green chile and some cashews. sautee spices, then onion, then add the puree, yogurt and coconut milk. Voila! You’re done. Altogether this took me just over 30 minutes to prepare and cook. 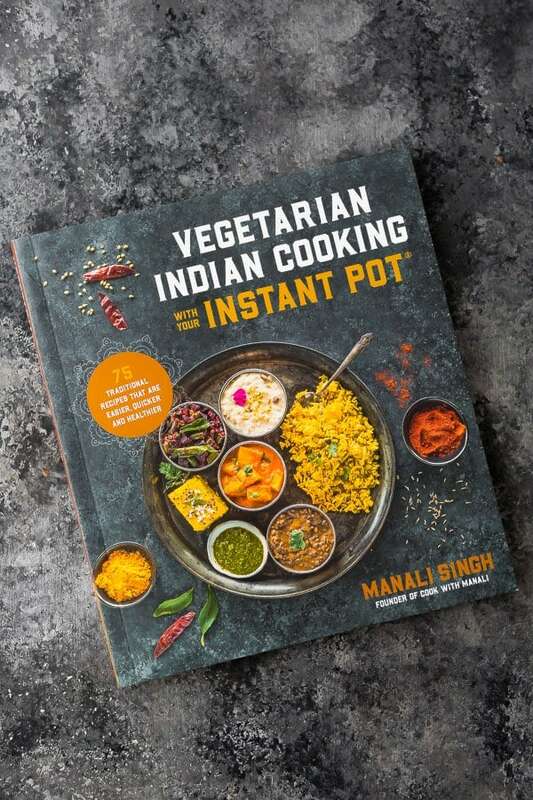 If you are looking to add more vegetarian recipes to your diet, I highly recommend checking out Manali’s cookbook Vegetarian Indian Cooking with Your Instant Pot. There are 75 vegetarian recipes in the book, each of which has it’s own beautiful photo and concise instructions. 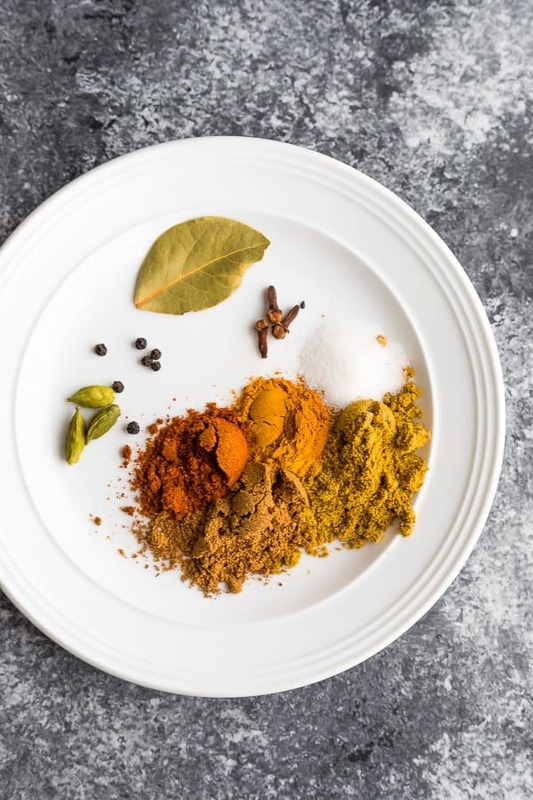 I have bookmarked a whole bunch of recipes to try for our family, including Kadai Tofu (page 70), Panchmel Dal (page 48) and Paneer Tikka Masala (page 27). Manali’s book is going to make my quest to cook more vegetarian dinners so much easier! 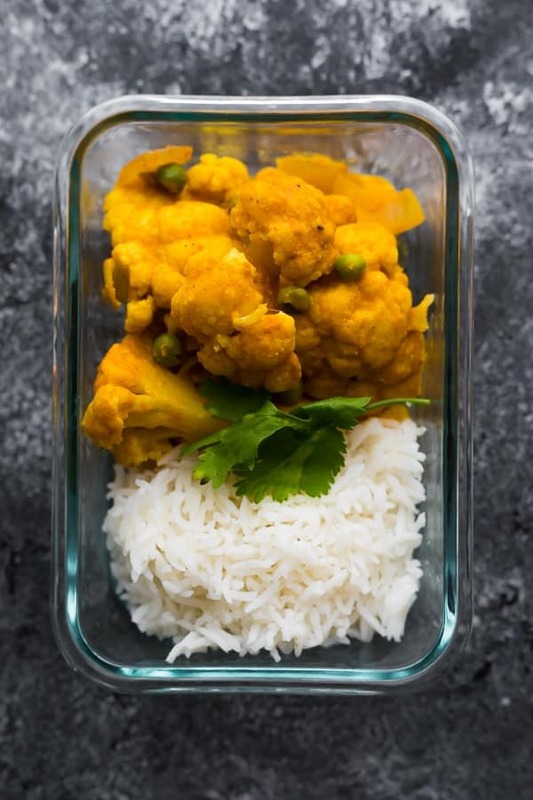 Not only did this Cauliflower Korma make for a delicious dinner, but the leftovers made for excellent meal prep lunches. We even froze a few portions and they thawed perfectly! Set your yogurt out an hour before cooking so it comes to room temperature. 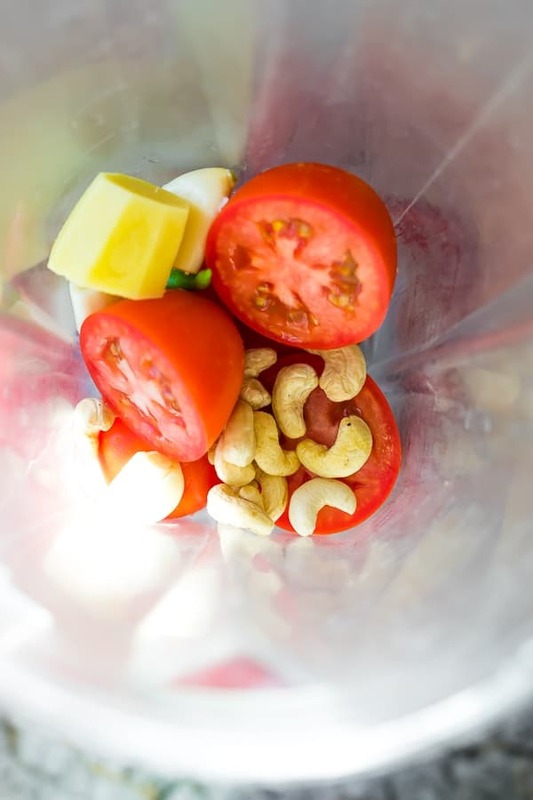 Place the tomatoes, garlic, ginger, green chili and raw cashews in a blender and blend until smooth. Select sautee on your Instant Pot. Heat oil, then add the bay leaf, cardamom pods and peppercorns. Cook for a few seconds until fragrant. Add the puree from the blender and cook for 2 minutes. Add the ground coriander, garam masala, chili powder and salt. Stir and cook for 30 seconds. Carefully add the yogurt, whisking so it mixes in properly with the rest of the sauce. 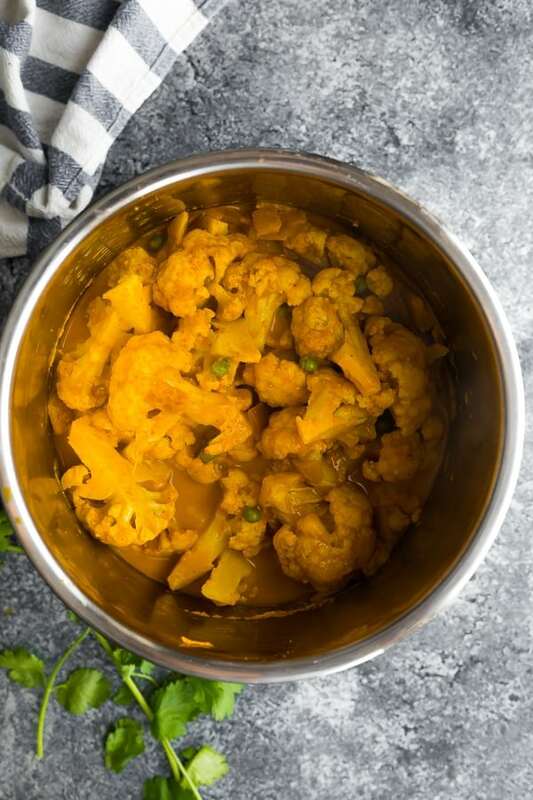 Add the coconut milk and water, then the cauliflower and peas. Toss everything up in the sauce. Put the lid on your Instant Pot, seal the valve. Pressure cook on LOW for 3 minutes. Do a quick pressure release. Taste and adjust the salt if necessary. Serve over rice with fresh cilantro. by Manali Singh © 2018.